Well, now that I am completely over wednesday’s loss, I have started to see things more clearly 🙂 I said that before as well, even wen I was really mad at the team, I cant help it but just love the perfect ‘X’ that Afridi makes with his body but there’s definitely more to it than just the X-factor. He represents Pakistan in the best possible manner: he’s aggressive, emotional, passionate, vocal and very unpredictable. He has great leadership qualities and I seriously think he should be retianed as the captain of Pakistan one-day side till the next world cup . Once Younis and Misbah are kicked out from the team, he can easily bring the young, inexperienced team do a great job under his captaincy. He can bring stability to the young side which unfortunately has to wait till 5 days before a series starts to even know who the captain is. I hope, Afridi, alongwith Waqar Younis would be retained and would be allowed to do their job till the next world cup…something which seems very very unlikely in Pakistan. But I wish, really wish, that for once the PCB would do something in the name of stability. No, I am not calling the Pakistani players bastards….I am disappointed and heartbroken but I am done with my wailing and have comforted myself that there can only be one winner, that winner can win by merit or can be gifted that victory but at the end of the day, the winner takes all and yes, I want to be an Indian right now…but, wait, I am supporting Sri Lanka on Saturday because I know they can avenge Indians just like they did in 1996. Oh God, stop me now, I dont want this post to become something I dont want it to become. 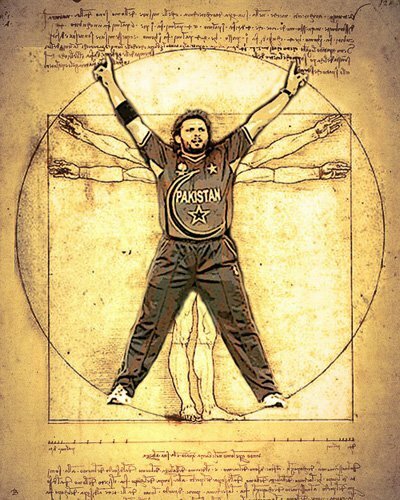 And yea, I cant help it but I still like the perfect ‘X’ that Afridi makes with his body after every wkt. So, I shal talk about something else: Dogs! I dont know why I seem to attract them! I mean, why do dogs come and brush their head on my body wen I dont even look at them. Cant you see I am a hijabi woman…who does not hate dogs if they are just being cute and staying away but definitely hates it wen they rub themselves all over my clothes and I have to come back home, feeling disgusted, needing to change before I can even read my namaz! And no, it aint funny, especially on a day wen I am already feeling blue! Pakistan has already won more matches in this worldcup than the last two world cups combined, if that wasnt enough, Pakistan has actually beaten Australia to be at the top of the group which featured both Sri Lanka and Australia, has qualifid for the quarter final and will be up against West Indies. Now west Indies is the team which definitely came out to be the better of the two wen the two teams met in the last world cup, but if Pakistan wins, it will be through to the semis, again first time after the ’99 world cup but this time it will be up against Australia or India…God, thats already too much to handle for weak hearted like me! Although its just the matter of holding the nerves for three more matches but is Team Pakistan really mentally strong enough? Obviously, I wouldnt have been thinking like this if I was an Australian but I am really proud of the fact that even though Team Pakistan had been through all sorts of problems from wicket keepers absconding to the best seamers in the world being banned for match fixing, it was actually able to bring all the odds together.